It's nearly the most wonderful time of the year again - Christmas! The red Starbucks cups are out in full swing, the town's Christmas lights are shining bright and all the Christmas adverts are bombarding our television screens... All clear signs that the festive period is well and truly on it's way! Unlike last year, where I found myself waiting for the postman to deliver the remainder of my presents on Christmas Eve, I have been one very organised elf this year! I have already bought the majority of my presents, and even managed to wrap them up (I know, I have seriously shocked myself too!). In fact, I think this is the most organised I've ever been for Christmas! Although I'm not proud of myself, as I credit my organisational skills down to avoiding university work and the dangerous distraction of online shopping... Oops! Really like this outfit, and how the necklace matches your skirt! Keeping that African theme! Love it. Absolutely GORGEOUS outfit. I love how it can be casual or dressed up. How have I not come across your blog before is beyond me?! You look lovely great outfit. You look great and that necklace is gorgeous, what a lovely piece. You look so pretty and stylish! I really like everything you're wearing, but especially the sweater and the necklace. Love the tasteful combination! You look stunning, dear! 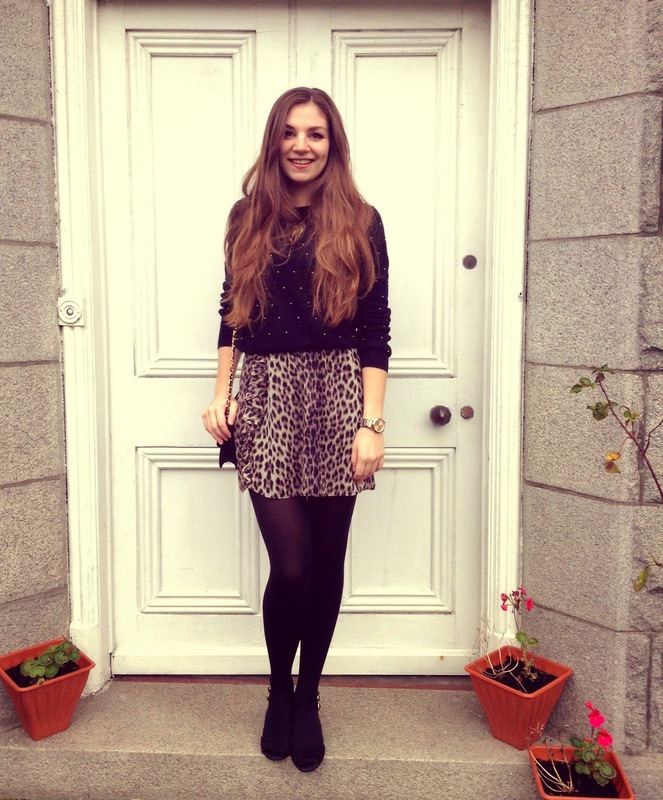 This leopard skirt is so cute, and I love the necklace! absolutely gorgeous!! i'm your newest follower, i love your blog! That necklace is amazing! You look great. I'm in love w/ your outfit! Your skirt is stunning :) perfect! A girl after my own heart...leopard is my favorite! Great look. Really love this look! That sweater is so simple yet chic! Beautiful look, love the animal print dress! Also if you need a blogger template you can find my premade designs for 20 dollars at my etsy shop KayLuxeDesign! I'm loving that animal print , you look pretty. Totally love the outfit. My G+ for you Helen. Perfect. very nice outfit, I love the sweater!! Your hair is perfect and I'm loving the elephant necklace! Lovely Outfit :-) Thanks for sharing. Gorgeous outfit! good job on the presents! Love this! So perfect for the holidays. Hi Helen! I'm loving this chic casual look! The skirt is just awesome! I love love love your outfit! It totally rocks! Fabulous leopard and sparkles. Another adorable skirt and look. I do love your hair, so pretty:). Estás muy guapa! Me encanta tu look y el colgante de elefante es ideal! Wonderful look! I really adore the skirt! che bella che sei, complimenti! Il look mi piace moltissimo! I wanted to say I love your skirt but then read that it's a dress. :) I love everything with leopard print! Your necklace is soo cute, I love it! Love it, especially the necklace! Gorgeous look, you've got an incredible style! 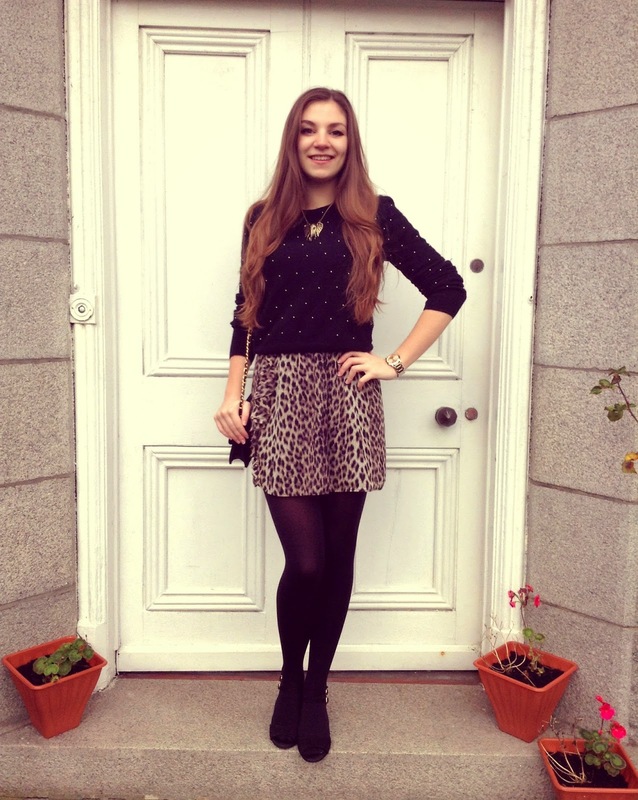 I love the leo skirt and the way you styled it and the elephant necklace is adorable! you look beautifull, I love your skirt and your necklace is very pretty! Perfect! Love this outfit, that sweater is so cute! Have a nice weekend! Amazing look! I love the skirt and the sweater! I love the jumper. I just wonder how to wash it! I loooove your sweater! Very cute very stylish. I would love if you check out my blog. helen! that necklace is so unique :) looks great with your entire outfit! I love when you find something you love so much you wear year after year. I also love pairing my summer dresses with jumpers and tights. Love this outfit. Well done on having done most of your Christmas shopping now, that's impressive! I also love Topshop and I can see why you do girl, you really suit the brand's clothing!! :) Have a wonderful weekend! Gorgeous outfit and you look beautiful as always! Xmas time is coming so soon! Dear Helen, beyond your stunning beauty there's an innate sense of style. I love this mix of prints, very cool! Perfect outfit! Such a nice combo! 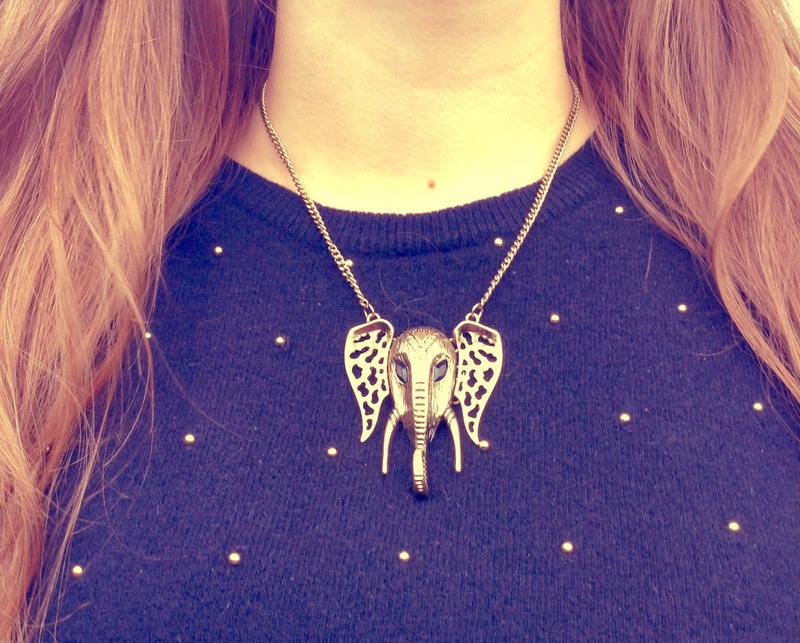 Omg I'm obsessed with elephants, so I'm obsessed with that necklace! Love the whole outfit! Lovely look, and I especially love the necklace. Nice pairing with the leopard skirt :). I love wearing all my summer dresses right through to winter too! And oh you're making me so jealous of your organisation - I've only bought one present so far.... One. Lord help me. How cute can somebody be? <3 Tons of love, sweetie! Love the look, the skirt is really beautiful. 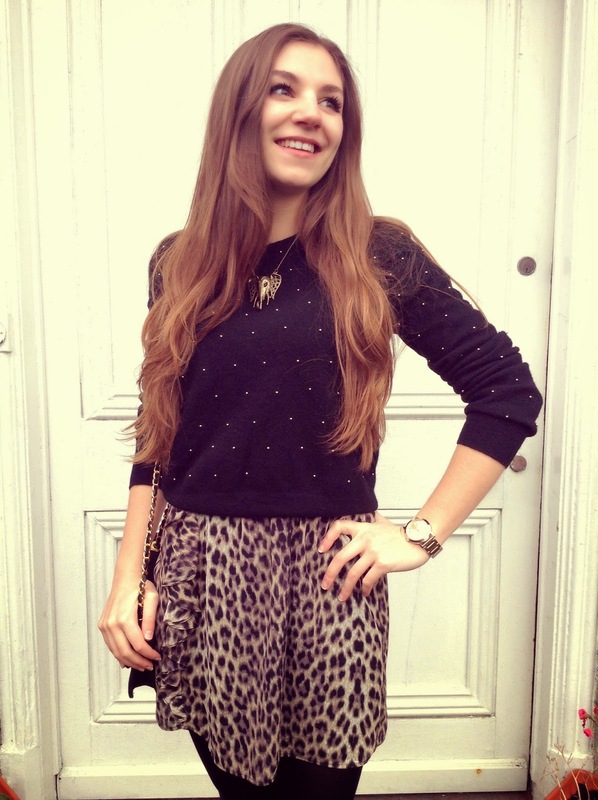 Super chic in leopard, babe! This is such a cute and chic outfit. I love your skirt & the necklace! Great look and nice girl !! love your outfit and your hair is amazing! This looks is super adorable! the sweater is super pretty! love! This combination is super cool, I'm in love with the necklace!